yeah, I am terribly late today, but it ha its reason. Coming to that a bit later. Yesterday I had a GREAT wake-up event! Well, you better could say the opposite. About 7.00 in the morning I suddenly woke up and sat right immediately. What was that?? I was woken up by a terrible noise coming from the kitchen door. Looked at my side, didn;t find Jan. So I jumped out of bed, I really thought somebody came in through the kitchen door(somebody breaking in ), although it is hard to get into our garden, which is surrounded by other. So upset and with booming heart I got into the kitchen and asked Jan what happened. It seems another strange cat was visiting us, Dikkie Dik attacked, Jan woke up by it and got the cat out, he frightened him well, and therefor he also banged the door. Oh my God, I had to sit down to get to myself again a bit, didn;t go back to sleep anymore. No, this is not the way I like to wake up!!! I took a nap later in the afternoon thuogh. The late posting today has all to do with "Koninginnedag", the day that our Queens celebrates her birthday by visiting one or two towns. Must not have been easy for her and the family, cause her son is still in coma, as far as we know. Everywhere in the country there are fairs and free markets an all kind of events. So we went to town too, to take a look. The weather couldn't be better. Lots of sunshine, nice temperature, all to make you feeling happy. First a quick visit to an aquintance, who has a lovely shop with all sorts of liqueurs, a lot she makes herself. We just said hello, cause she is very busy on these holidays, but she gave us a salted haring and it was delicious!!!! Yummie, I like them! 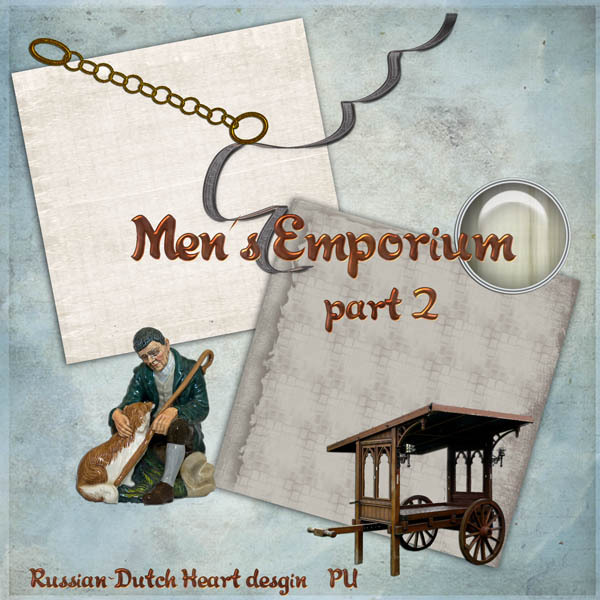 Then we moved on and walked around several freemarkets, where everybody can offer things for a very small price, of course, but you can find very nice things there! And I lost my heart there LOL! We passed a little stand and what did I see?????? Two big pluche bears. As you might know I have a crush for pluche bears, but.we walked on.only.....after a few moments I returned and asked the price. And you will not believe it, they were only € 0,50 a piece. I couldn;t believe my ears. Couldn;t resist and bought him, gave the lady an € 1,00, cause I almost felt ashamed. But he is adorable and I can prove it, cause at home I made a photo of it. Is he cute or isn't he????????????? There also was a not so happy note this day. Walking around on the big fair, we met friends, we know already for a long time, we don;t visit eachother much, but always keep in touch. And then we heard the man is diagnozed with cancer on several spots. Damned, that isn't the news you want to hear on such a cosy day, meeting your friends.! But that is life, bitter and sweet are always at eachother's side! We walked on, and looked around some more freemarkets, and then decided to go home. 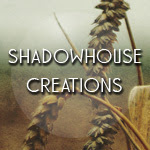 I have lots to show or give links of, so I better make a little list of them. 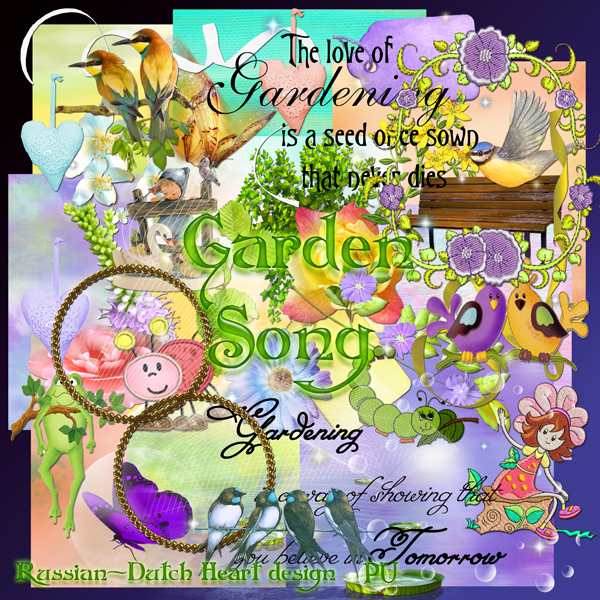 Mat has made a beautiful quickpage of the Garden Song kit, to download on Miriam's blog. Then Kay made a lovely header for her blog, with the Weaving Dreams kit. 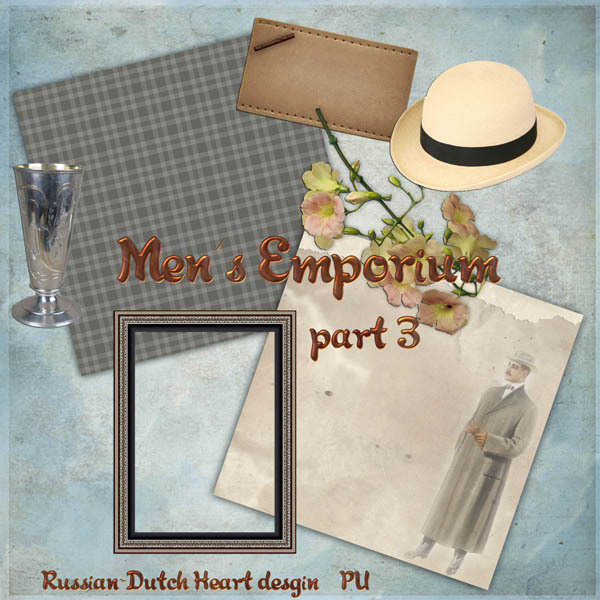 Miss Edna has another lovely quickpage for you to download on her blog. Now Arlene, of course! I still have to upload a few files from her, I am really behind in uploading!! But I have some great clusters from her, made out of several kits of mine. I have a couple of photos more of today, but I will save them for the post on Wednesday. Now the last thing is the kit from me, ROFL. 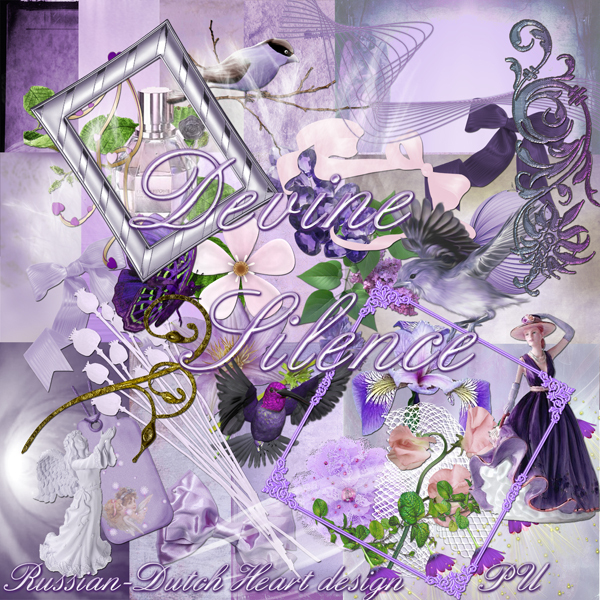 Hard to choose which one, but I think this is a very nice one, named "Devine Silence". Hope you all had or stil will have a wonderful day! Wednesdaymorning I had the lungspecialist appointment to do. That was a very quick one. He isn;t very talkative, which is okay for me, I think he just says something when it's really necessary. So I was ready after about 10 minutes. But he wanted to have a checkup foto of my lungs, and I could get that done right away. In the afternoon he called me and said it was okay, no changes, so I was happy. All together it took me about an hour, to get home again. Quick, yeah! Then I called Heidi to ask if she was home, she would be, but a bit later, so I first had a sandwich, watched Bargain Hunt on the BBC and then left for my visit. It started raining by then, not too hard, but it was a pity, cause we couldn;t sit outside in Heidi's garden. I gave her the little plant for her garden, to "celebrate"her wedding anniversairy and I think she was very pleased with it. We had a little chat over a cup of coffee and after an hour or so I returned home. Didn;t had much chance to do something about the house that day, so it was planned for yesterday. And yes, I was pleased about myself LOL. Did a real thourough vacuum cleaning, after having a good and thourough dusting first, in the mean time the washing machine was busy, and when all was done, I was a happy person. About our government: the remaining cabinet came to an agreement with several parties of the ooposition about a plan for budgetcost cutting, that they will try to get started in the next few months. Some things are good in it, but other things will hurt only the average working men and pensioners. We'll see how much effectively will get through. And in September there will be new elections, for a new government. And may be the whole plan will be changed then, if other parties will be in majority, so in a way it all is rather uncertain. Oh well, we will survive this too, I suppose, as we did other crises before. Today I think I will just do some of the last weekend grocerie shopping, which will be very quick and then take it easy. Jan will visit today a few emplyment agencies, specialized in health care, and if one of them take him in, at first he will work as a flexworker, which is a bit uncertain, but better as nothing. They do need all the time people in health care, the last few years there is a shortage so I think there is a good chance he can work a lot of hours. We'll see how it works out. I have new goodies for you. First you must take a look at Linda's blog, where she has two wonderful quickpages, made with the Charming Time kit. Leave her a little thank you if you download, she's so nice to offer them for free! 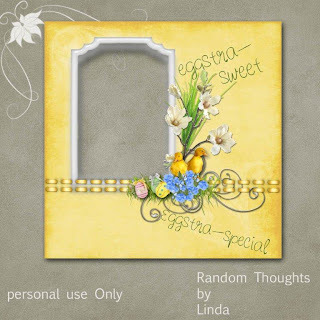 Then you also can pick up a sweet quickpage at Miss Edna's blog, with a sweet little bird on it, of one of her own photo's! 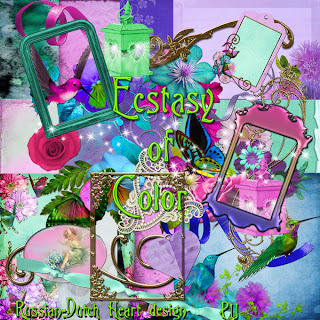 And Arlene has made some great clusters with my Ecstasy of Color kit!!!! And she keeps filling my mailbox with fantastic clusters and quickpages for you! And I had trouble deciding which kit I would offer today LOL! As some of us have rather nice weather but also people seeing snow coming down, I thought we ALL could do with a happy kit, that can strangthen our dreams about a wonderful summertime, grin grin. 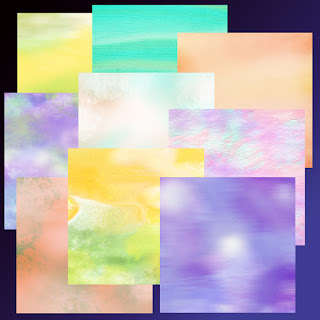 I have 2 previews for you, one of the whole kit and one of the papers. 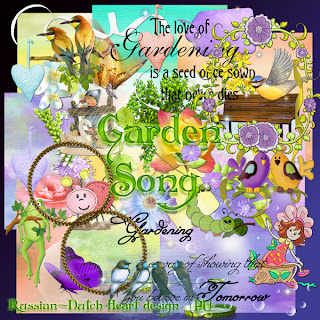 It's named "Garden Song". Now I will have to make some fresh coffee and soon have to wake up Jan, so I better finish now, wishing you all a very lovely weekend. Thanks for all your sweet messages, believe it or not, they are important! I have an appointment ith the lung-specialist today, an annual visit or check up if you wish. So I must do this posting quick. But wanted to do it anyway, cause may be after my return I will go for a little visit to Heidi, if she's home, it's her anniversairy of her wedding day(today 7 years) and I have a little garden plant for her I want to bring her. Well, I am happy to be able to tell the doctor that in general I am feeling much better than last year, and all by all it's going okay with me. Weather isn;t to bad in our part, temps around 57 F, but lots of sunshine and the weatherman said that by the end of the week we might have temps around 68-70F!!! Yeah, that's more how I like it. Sorry for not a longer post, but just sometimes it isn;t possible LOL! 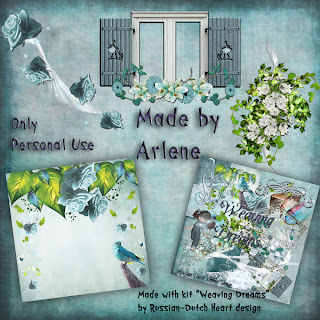 I have some very nice clusters from Arlene, made with the Weaving Dreams kit. 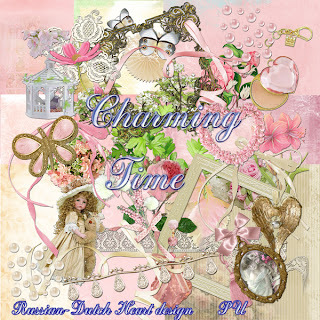 And the kit is in pink colorscheme, named Charming Time. Now have a wonderful day! What we expected just happened! The news came out during the weekend: All cabinet meetings were for nothing! The 3rd party took out the plug so to say! So there's no agreement about the bidget cut downs, plan for the short and long terms to get the economy vivid and sound again, we now have a minority cabinet as "boss of the government"and most likely there will be coming new elections to form a new cabinet. But due to certain rules in the law, it will only be somewhere in September, if it will happen. But I gues there is no other option for the remaining cabinet than to resign. Oh boy, what a joy for the country and how good this must look to the world. For 7 weeks they were talking and dealing about a program for the bidget cuts and how to get the the money for it and boom!!!! all for nothing. 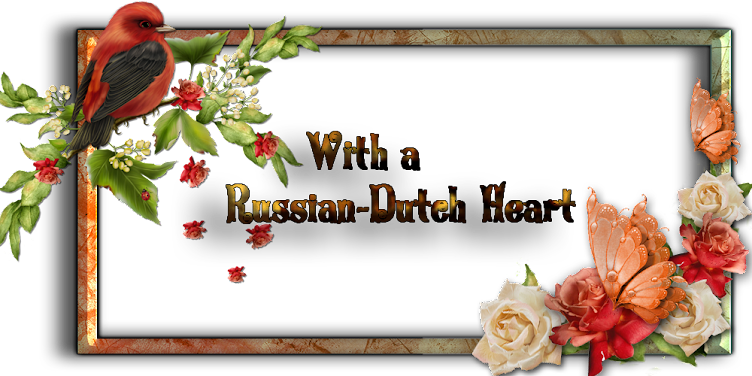 We will never hear about the real reson why the 3rd party, the PVV, pulled out the plug. Everybody has his own ideas about it, but it couldn;t just be for the reason they announce at the moment. Not only that. Takes too far to explain it all, if I ever could, but fact remains that we are having a probably caretaker government till there will be new elections. And I am asking myself: how long it will take till they will have formed a new cabinet? So you can guess a lot of the news during the weekend was about this event, which isn;t very good for the country at the moment. Still we also did some other things LOL! Not too much, I did some household tasks on Friday, so the weekend was about free so to say. And I took this "free"time in both hands. Did a lot of designing, and yesterday even sat for a moment in the garden, and did some small work in it too. Although the predictions for this weekend weren;t too good, lots of rain should fall, in our area we didn;t had much of it, at least not during the day. During the night I don;t know, casue then I was sound asleep. We were kind of blessed with a lot of sunshine, though the temperature wasn't really great. Most due to the wind, which was blowing from the wrong direction. Th e only thing we are looking for at the moment is another table in the garden. Yes, we have one, coming with the chairs, but it's a little big and taking a lot of place. We are looking for something about half the size. In some folders we see just the thing we want, but it's coming as a set, with two chairs, and we don;t need chairs. Bummers, that's our luck again LOL> But I am sure we will find something we like, it could even be standing at the street, cause a lot of people our cleaning out their gardens at the moment and buy new stuff. I sometimes got some nice things there, and it's for free. May be we will take a look in the re-cylcing shop, have to go there anyway one of these days, cause we are in need of some bigger pots for our plants (inside). 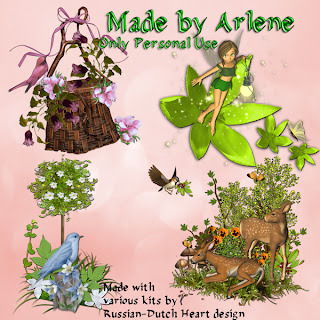 I have again some great clusters from Arlene for you. This lady is sooo creative with the stuff from my kits, she amazes me every time again. Today it will be clusters and also a quickpage from the kit "Spring Explosion". And I have also in stock from her clusters from Weaving Dreams and Ecstasy of Color. 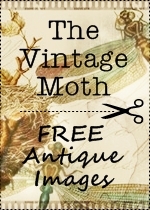 So the next few blogposts you are in for some wonderful treats! And I have too a new kit, I am going like mad these days, they just roll out of my fingers ROFL. We have had some soft colored ones, then a much brighter one and now I have another Beatrix Potter one for you, hope you will like that for a change. 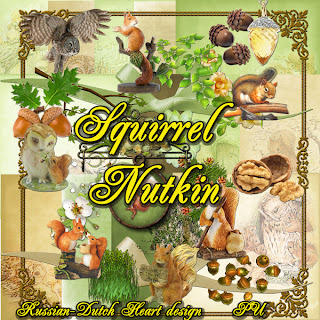 Just named it "Squirrel Nutking" ( I like those little rascals!!). Anyway, let's try to have a nice day, wishing you the same. After the really nice weeks we had, now the weather changed it's mind. Temps aren;t too great, and from time to time we have rain showers. I suppose it's a good thing for nature, but too much isn;t a good thing either. We still are lucky to have some sunny periods in between, but not good enough to actually take a seat in the garden for a moment. Hmmm, I suppose we have to pay our debt to Mother Nature, for the good weeks we already had so early. However, whenever it's a sunnier moment, we go checking in the garden and you almost can see our seedlings grow when you're looking at them. Jut about a week ago Jan planted some sunflower seeds in little pots and had to repot them yesterday to give them more space. Well, they have to sprint to grow to their final height, around 2 mtr!!! I do hope some of them will get to blossom, they should be red. Nothing much to share with you about the last two days. We are folloing on tv some debats in parliament about several subjects, although it's not a good thing for your health LOL. And government parties, of which our president of parliament is one, are busy with meetings, to reach an agreement about necessary cuts on the budget. They are doing that already for weeks and that isn;t a good thing. Well, at start they were for long hours together to "bargain"about their plans, but the last two weeks, they just gather for around two hours in the morning then another day some in the morning and a few in the evening, very confusing. And I have the idea that in the mean time our country, which is in need of government, is left a bit alone. There is a recession going on, and yes, there has to be cut down on government budgets, but who will pay for that? Everybody will do that, but as in general, the lower and middle class will notice it the most. There must be going something wrong, if there is no equal share or of the benefits and burdens among all. No, I won't do a speech on my soapbox LOL. It will only get me into a bad mood and I don;t want that at the start of the weekend(well, almost). I do have some uplifting things for you. Fist there are some wonderful QP's to download from Linda's blog. 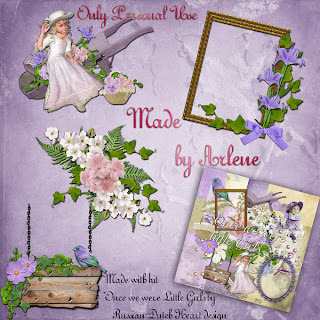 She used some of my kits and also made a lovely layout with one of them. Really worth the visit! I'll show you just one of them okay? And of course Arlene has made more fantastic things for you! I already received some clusters from her from the last kit, but that will be for next week, today I have her clusters made with the "Once we were little girls"kit. And I asked you to have a pair of sunglasses at hand for today's kit, didn;t I?? LOL! Well, it isn;t that bad, but in all this kit is of much brighter and stronger color then usual. I suddenly had the urge to use some real strong color and came up with "Ectasy of Color". There is even a stacked paper for you in it. Hope you will like it, I did love making this one. More Autumn like than Spring. yeah, to my disappointment I have to say weather isn;t really like it was a week or two earlier. It is feeling even a bit like Autumn, cold wind, every now and then some rain, but for short moments we still do see the sun. I wanted to go out yesterday, but looking out of the window I decided to stay in and try it today. Oh, I had something strange going on yesterday. At about 11.30 someone was ringing the doorbell. Okay, that's nothing weird. 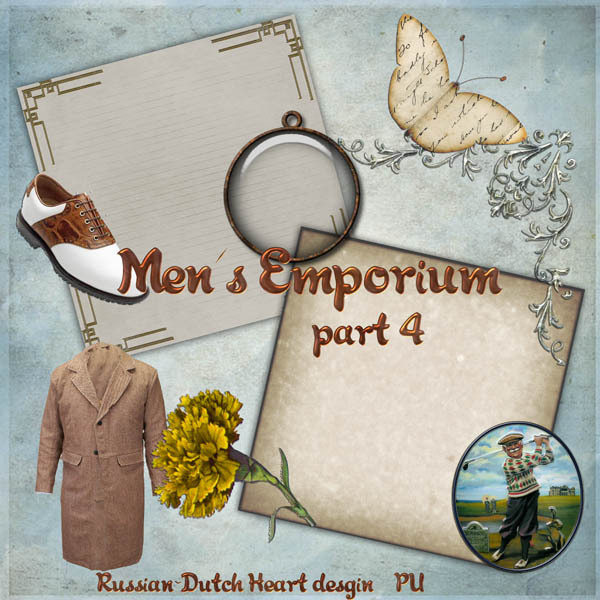 I opened the door and saw two men standing, dressed in kind of working clothes, with and orange jacket, with some company name. I asked what they wanted and they said they wanted to check the gasmeter location and pipes to it, cause in a couple of weeks the gas pipes in the street should be renewed, I asked for which company they worked, and they said it was ordered by the sity council department for streetwork etc. Hmmmm, strange, so I asked if they had an ID of their company. First he showed me just his driver licence, well, very nice, but that doesn;t help. Then he said he would go for a little booklet(kind of passport) at his car, came back with it, it stated some company name, in another city, but that also didn;t convince me. So Iasked again why they came now, and why I did,t receive a letter from the city council about it. Because normally if street work will be done the kind they talked about, we are notified and also if there will be a company checking our meters, of pipes or whatever is necessary. They said then the letter would arrive shortly, but they were "in the neighbourhood"and thought they could do the checking already. They looked alright, but somewhere I didn;t trust it. It was a vague kind of story they told me, and the more, if new gaspipes where to be placed, the connection to underground pipes is outside the house. So I said I was sorry, but I first wanted to have the letter and read about what it was going on and if it was necessary they do that checking or survey, they had to come back for it. They were very polite, and said they understood and then left. Perhaps I was just too suspicious, but you have to be very carefull now a days with letting some stranger into your house, there are lots of people who take advantage of good willing people buy those kind of stories(they are from the electricity company, they are from a magazine company, or whatever) and then you get robed or worse. Oh whee, I was just nicely curled up in my bed yesterday and almost asleep when I heard Brodski in the hall, meowing in his strange way. And I knew it!!!!!!!!! Another present in form of a little mousie!!! So I crawled out of bed to take a look, and yes, I was right. So I directed my cat to the kitchen, took a piece of kitchen paper to take the mousie out of his mouth. But this one was still alive! I have no fear of them, but normally they are already dead when he brings them in, not this time. So when I tried to get mousie out, it slipped out and disappeared under the washing machine.!!! Oh glory, dumbo me! Perhaps the mousie died anyway, later, and lies there somewhere, or it had been lucky and could fine a little spot in the floor and got "underground" to continue his life LOL! We'll see if one of these days Brodski will catch him anyway. I think my big hunter was all disappointed that I lost "the present". He sure looked up to me with very sad eyes! Enough rambling of me, have to do some things here today. I have some real beautiful clusters from Arlene for you, made with the "Temps des Roses" kit. I am convinced you will like them! And also a kit, still having lots on the shelves for you, and adding to it! 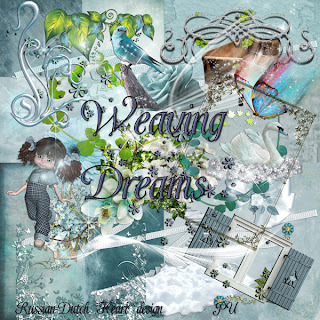 This time another soft colored one, named "Weaving Dreams". And I think Friday I will have just the opposite for you, it will be a rather bright colored one!! !Take out your sunglasses of the drawer and lay them near your computer screen so you have them by hand on Friday LOL! Garden looks a real garden more every day! Oh, nice thingsto show you, goodies too! That will be a bit further on in this post. Friday was kind of busy day. As planned I did the shopping, was back rather quickly, we both had a sandwich and then walked to the market. It was nice weather for it, and a lot of people thought the same thing. But is was a good trip, we came home with a filled shopping car, with some veggies, and fruit. 4 big mushrooms, oh and also some meat. That not from the market, but Jan had seen close to it a butcher, with beautiful meat, for a bit lowe price than the average. It was great at the market, you could buy lots of things for just 1 euro, which isn;t much. And we even didn;t buy any plants, whoooo! So when back I started to cut the red cabbage to cook it half and put in bags for the freezer. Gosh, we only did buy a little cabbage but I have lods of bags from it. It is quite a hard job to cut it, but I managed. Only nasty thing is that afterwards your fingers are all purple!! But I could get rid of it buy washing them first with a dish washing liquid and then used some lemon juice. And all was gone. The big mushrooms we had for dinner yesterday, filled with mozarella and ham(ham cut in little pieces), then cooked it in the oven. They were real tasty and looked nice too with a bit of chopped parsley on them after I took them out of the oven. Today I should prepare the beans for the freezer. I was happy to sit down after the cabbage task, and we spent the evening watching some tv. Saturday was an easy day. I just went out for the weekend paper but also had to get us some soil for the gardenpots, and that's a tricky business. Can you guess??? Yeah, I came home with a large sack of soil, but also with some lovely plants. !!! But they look real nice in the garden, we were lacking a bit of color. I left it to Jan to plant them, he is always protesting when I say I have a little bit of work for him in the garden, but in fact he enjoys it! So we worked a little while in the garden, which was ever so nice.! Our seedlings are growing real nice, I hope they continue doing so, then in a couple of months we should have some sweet peas, sun flowers, some more of which I don;t know the exact name, and also some peas and sugar beans, and even more things are showing there little green heads above the soil. That are all bulbs and some other seeds Jan planted. Sunday was just a "doing nothing"day ROFL. Let's move on to some goodies for you. 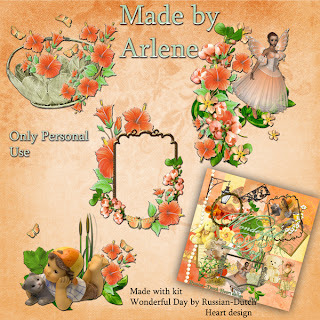 First I have part 2 of the Wonderful day clusters by Arlene. 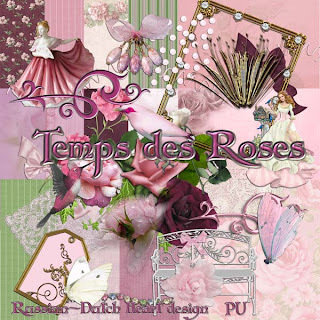 And oh, she just sent me another mail with lovely clusters from the Temps des Roses kit and Once we were little Girls kit too! So next couple of posts you will see those too! Then another goodie for you, made with the Wonderful Day kit, a quickpage by Linda, which you can download on her blog! 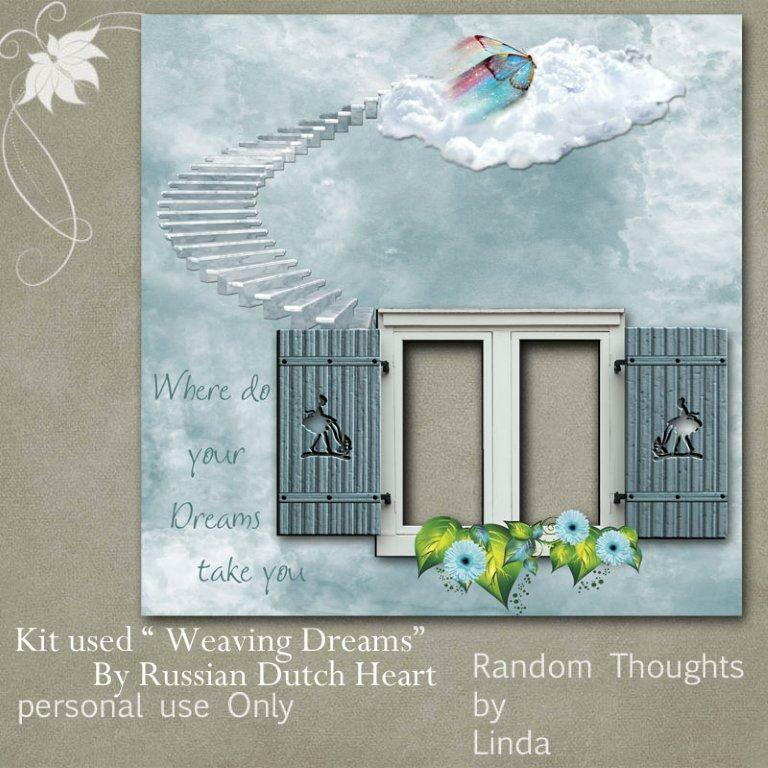 Then Kay did sent me a lovely layout, made the the Fairy Pricess kit. It's realy such a sweet one, take a moment to go to her blog, where she shows it. Slowly it's getting time I end this post, to have one more coffee and then get a bit busy around here. 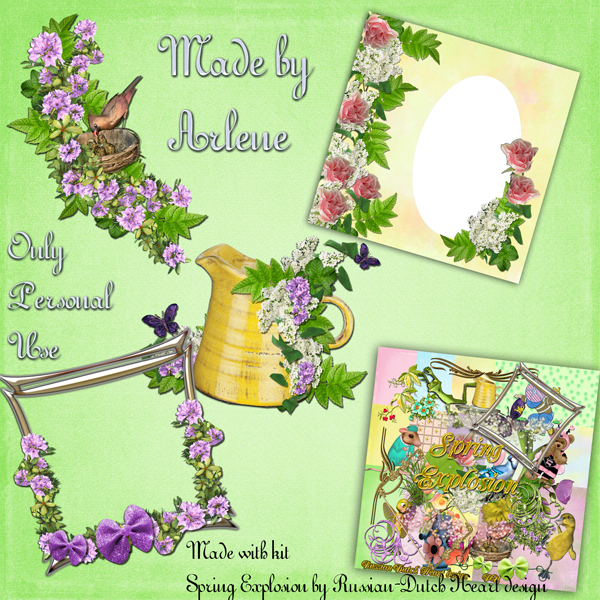 I have a real Spring kit, had to split it up in two downloads, and first thought to give you just the 1st part and Wednesday the second, but what the heck! LOL! I give you both today, and hope you can do some nice things with it. 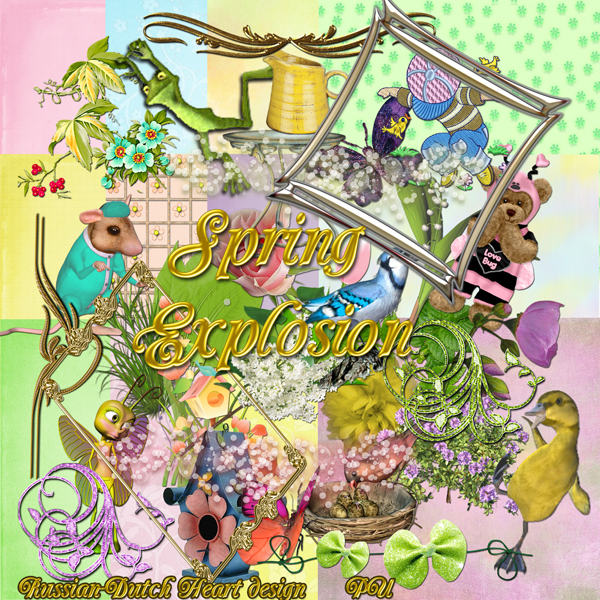 It's named "Spring Explosion". So be nice, girls, if you have any left, give a smile to someone at the street or in a shop. It makes that person feel better and you too ROFL! Did I do a lot of things the last two days? Perhaps I am lacking memory LOL, but I don;t think so. That sounds rather lazy, doesn;t it? No, it isn;t that bad, I did some things in the house, but I try not to do too much in one day. I did a bit of gardening, like replanting some plants in pots, they were in need of fresh soil and more space, even spent a bit of time reading some garden magazines in the sun. And Jan and I are almost looking the seedlings out of the soil, and with some of them it seems to work, cause there are a few that grow really well! But today will be a bit different. First I will have to do some shopping for the weekend(better do it today than tomorrow, hate it on Saturday) and then we also want to go to the market. Jan just went there Wednesday to take a look and told me alot of veggies are for a nice price together with some fruit too. So good time to make some "stock"in the freezer! And..... today there will also be the stand for garden plants again, ooops, very dangerous indeed. But Jan wants to look if there are already Impatients plants, and if they are not too expensive we might take some of them home. They are so great, they flower for months and give a happy view in the garden with all that vibrant colors. And who knows, may be they will have some more interesting plants, I should like to have some herbs and may be a little tomatoe plant, and perhaps some more seeds?????????? So not too much time to ramble today. 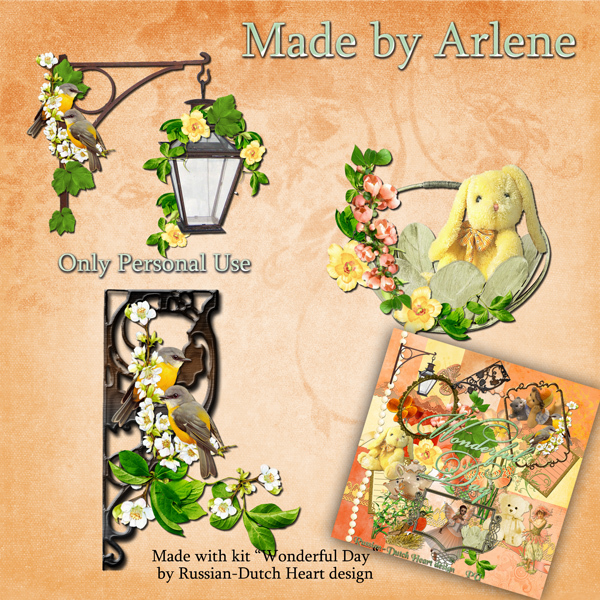 Today I have part 1 of some great clusters from Arlene, made with the Wonderful Day kit. She did send me a bunch of them!! Oh, I realize that it is Friday the 13th today!! Dangerous day LOL! I just read on teletext that an animal shelter had a terrific action.! They have a lot of black cats, waiting for a good home, so they "offer"them for a reduced price today.You always have to pay some money if you take an animal home with you(I can understand that, because they have expenses in keeping them and you are sure you get a healthy animal), but today you don;t have to pay the VAT. Isn't it a funny idea? I hope a lot of the cats will be picked up! Now I really have to get busy, so time for a new kit. 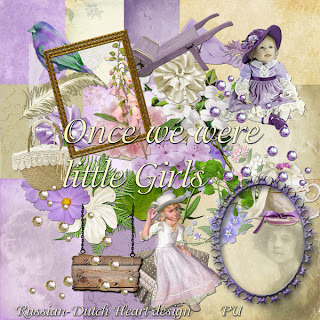 It's named "Once we were little gitls", all in soft colors, hope you like it.! Well, it's a bit harsh to say: "No more eggs" LOL! Actually we didn;t eat much eggs during Easter, except for chocolate ones! I love them, and most of all the ones that have a stuffing in it, of all kinds. And the best are the ones of white chocolate! Yesterday I went to town centre for a moment, just to look around a bit. Well, lots of shops, of course, but to say it is real cosy to walk around there, no. I didn;t buy a lot, just a package of red sunflower seeds for Jan, and yeah.......chocolate eggs. Now is the time to buy them cause all Easter stuff is now almost everywhere for half the prize. So although I could resist a lot of things, I couldn;t on the chocolate ROFL. Bought me a large sack of it. Oh yes, I did buy me a portion of French Fries, it had been a long time since I had one. I do see some of the comments your followers make & I really appreciate them. 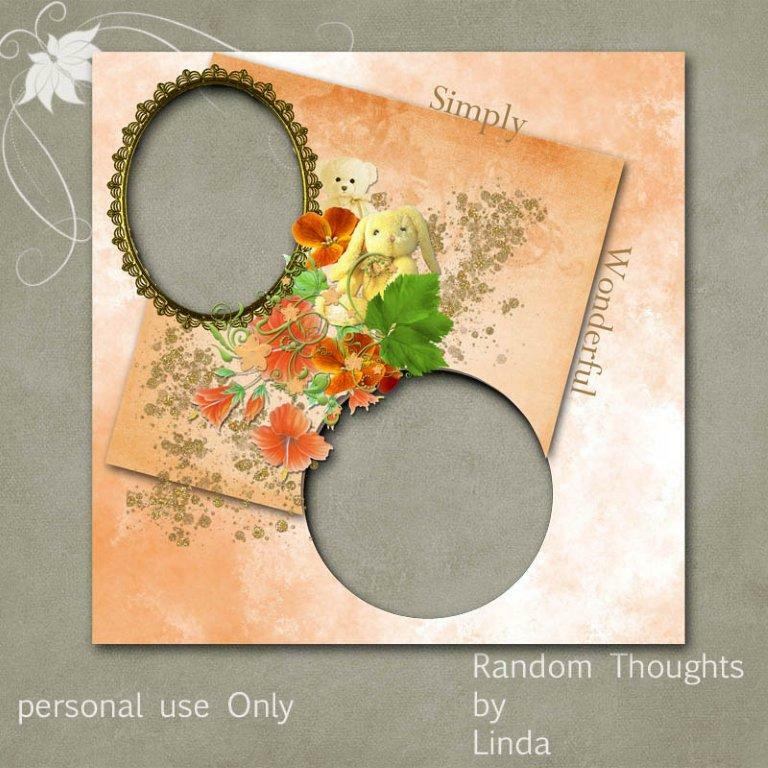 It makes me happy to know that others like them & can use them in their scrapping. I spend so much time alone & sometimes it can be really depressing. 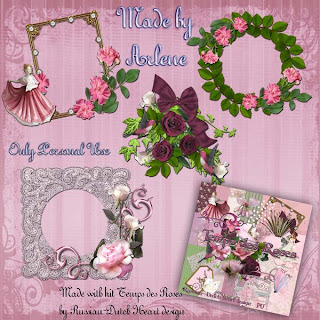 Knowing that others like & use my little creations makes me feel useful. Please say thank-you to all of them for me. All together I was a bit creative this Easter weekend, I even took some time to burn some stuff on disk, so it is safe. Still have to do more, also some of my resources I use a lot, will have to be burned to keepsake them, sigh! Well, today is going to be a very "normal"day again, shopping is needed, and I think tomorrow will be a good day for ironing some laundry, that I washed on Monday. Sometimes I wonder how do we get that machine filled so quickly, with just the two of us, LOL! Oh, before I forget, go to Miriam's blog, she has some nice goodies, as well as Matt, who made a qp with my Eveline kit. And Miss Edna has also the start of a new kit for download, just scroll a bit down there and you will find it! Well, time to try to get busy, grin grin, so here's the kit for today "Temps des Roses". I hope you had a great Easter Sunday. Here Easter isn;t over yet, we do it in 2 days. Well, I don;t have too much to tell, not much activity around here LOL! Friday afternoon I did a bit of dusting and vacuum cleaning, so Saturday could be spend otherwise. And so we did. I just got out to buy the weekend paper and returned home. Later in the afternoon Jan and I were watching some tv and at a certain point looked at eachother,knoodded yes, and weboth took a little nap on the couches ROFL. But not for as long as we thought, cause we suddenly woke up by the doorbell and who were there? Heidi and family, just dropping by to wish us a happy Easter. So we took something to drink, chatted a little bit and then they went home again. Nice surprise. Sunday I spent some time at the computer, how wonderful and for dinner we had our shrimps and potatoesalad and it was real yummie!!! It's a pity that the weather isn;t too bright, well, yesterday there was still some sunshine, but temperature wasn;t to be excited about. And in the eveing it started to rain and looking at the sky at the moment I guess there will be some more. Oh well, we have it nice and cosy and warm inside and I am sure this will be another day of not too much activity, LOL. Oh boy, our cats have the same idea, at the moment they are both on the couch far off in dreamland. But........you can tell spring is there, cause they go out a bit more. Have to tell you this. Friday night I went to bed and most of the time Brodski is coming with me, but it happens he first goes out for a moment in the garden to do his "needs". So while I was getting my pyama on I heard Brodski come in again, but producing a very strange sound. Hmmmmm, usually I know what that means. Okay, I went looking int the hallway and there he was, with a present for me in his mouth! Yeah, a little field mouse. What to do? I could remove the creature from his mouth(poor thing was dead already) and threw it in the garbage can. And complimented Brodski for his wonderful hunt-quality. You cannot punish a cat for it, it's just their instict. And yesterday evening he did it again! Hopefully the coming time he will let them in peace. 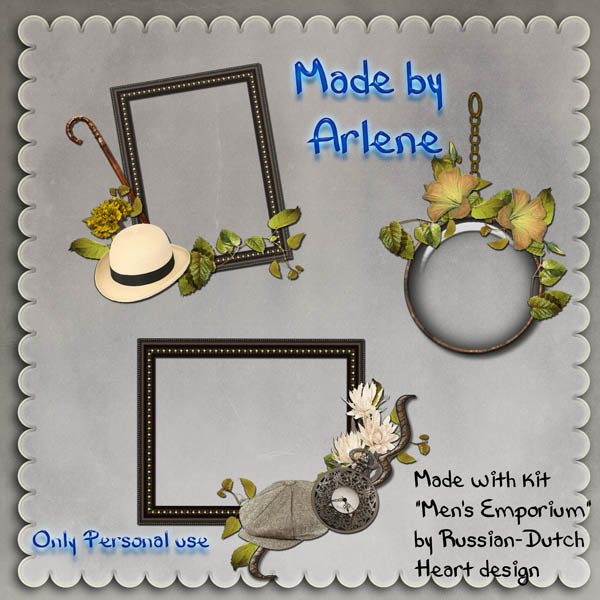 I have for you a wonderful freebie from Arlene, made with the Men's Emporium kit. And I thought, that after this "greyish"kit, we could do again with some happier colours, I think my friend Edna will like this, she likes orange LOL! 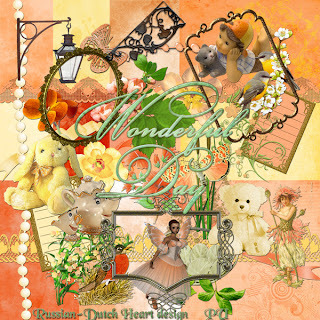 It's a very happy and springy kit, named "Wonderful Day". I somehow have the feeling I forgot something to tell, well, if so, it will come back to me, next time. If not, it couldn;t have been too important or interesting, ROFL. I wish you all a very happy day! We are having a little dipp in the weather lately. Still enjoying from time to time sunshine, the temps are down, even there was a bit of frost last night! Next couple of ays there might be some rain too(which is great for the garden), but then temperature may go up again. I do hope so, cannot wait till it reaches at least 70-85 F (between 20C and 30C)!!! Yesterday I did the shopping for the weekend, so I am all settled for that. And though we don;t do much about the Easter days, I thought we might have a tiny bit special dinner for Sunday. So I bought a sac of frozen gamba's(not the real big ones, but of a nice size) and I can fry them, with lots of garlic! Hmmmm, sounds good to me. Together with a bit of green salad perhaps and a bit of potatoe salad, we will have a nice meal. Today I will do a little bit of vacuum cleaning and dusting, I think, and also must take a look again at the seeds, if they show their little heads already above the soil, LOL. 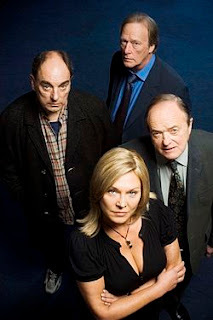 Yesterday evening we watched again on of our favourite detective series, New Tricks. I like the character sketching in it and also the humour in it, together with the personal touch in it. New Tricks is a British television drama series which follows the work of the Metropolitan Police Service's Unsolved Crime and Open Case Squad (UCOS). Led by Detective Superintendent Sandra Pullman, it is made up of retired police officers who have been recruited to reinvestigate unsolved crimes. The series title is taken from the popular expression "You can't teach an old dog new tricks". The "old dogs" are successful in adapting their skills and experience to modern policing, with their knowledge of past cases proving especially useful. The show itself has proved to be consistently popular, due to the well-known lead actors, high calibre guest cast and strong writing. Then there are new goodies from Arlene again.! This time quickpages and a cluster made with the Magic of Blue kit.! 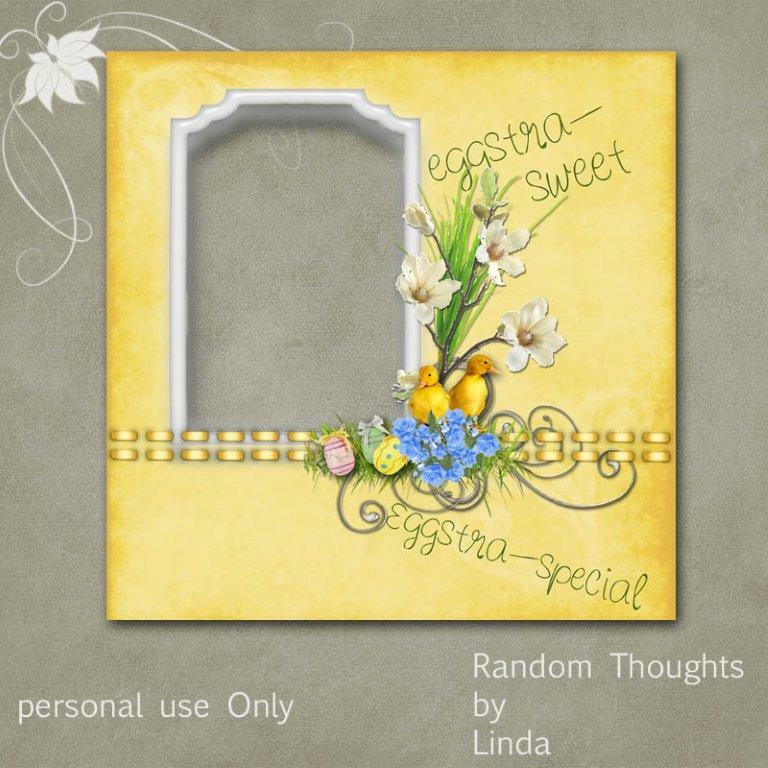 There's also a quickpage made by Linda, with my Easter Sweetness kit, you can download it on her blog, where she always has more goodies for you! If you need some more Easter Sweetness clusters, then you'll have to see what Mat did, on Miriam's Scraps. I think you are treated really well today, and it's not all yet. 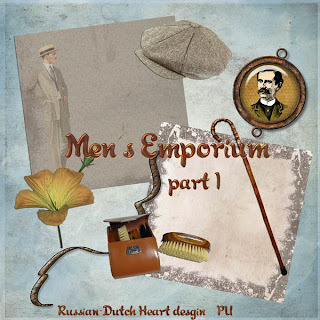 I have for you the 3 remaining downloads from Men's Emporium too! When I posted them, I think I will do a little blogwalking, then a bit of designing and then my little jobs for today, and have to think about my dinner this evening. Yeah, it;s Friday again, so Jan will make is own, the sweetie. Well, I am sure of one thing, it will not take too much time to make mine LOL. Perhaps I will make a baguette, with salami and some left over camembert, in the oven, I like it when the cheese has melted a bit.! I wish you all a very happy and blessed Easter! Monday my visit at the hospital was a quick one, I think I spent no more than 5 minutes with the doctor. Told her about the last epilepsy attack, and she wanted to have some bloodsamples of me again(it has been long time ago I had a check up for that), so right after my visit I did go to the blood stuff, and was lucky it wasn;t very crowded. So had that done too, results will be phoned to me by the doctor somewhere next week. Than I had to let check my social service nr. at the information desk, they do controll that every couple of years, but it seems I am still the same person in their data base LOL! The most important thing was I received new prescriptions for my medication(for a whole year, yeah!) and yesterday I went to the pharmacy to get some. I still have to do another hospital check up visit this month for my COPD, well, all is going well with that, so hopefully it will be a quick visit too. And by then I am quit ready with doctor visits again, and let's hope next one will be next year. Also made an appointment(finally) at the hairdresser and I'll go there later this morning, so I can;t dwell too long around here. Oh boy, it will be a good feeling to have had that real necessary hair cut! Yesterday I even made some pots with seeds for grean peas and sugar beans. Jan did make a pot with some more sweat peas seeds too, so if all will grow as it should, it will be nice looking this summer and we will have a bit of our own fresh veggies! 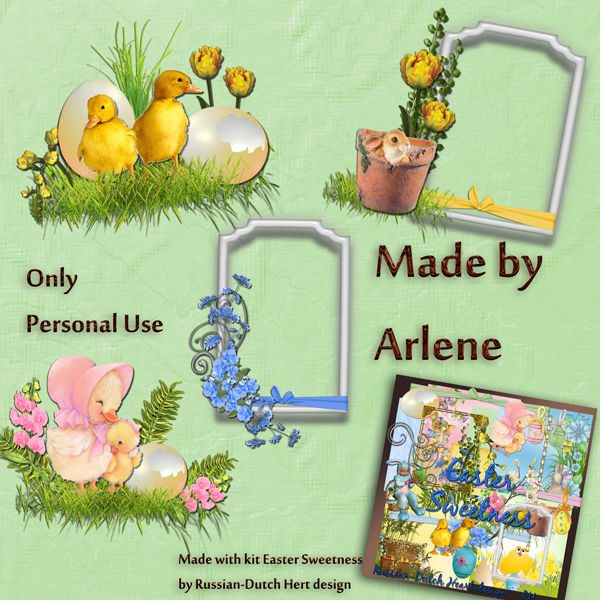 Time now for some more lovely clusters of Arlene, she made them from the Easter Sweetness kit. And I have some more parts of "Men's Emporium"for you. I'll give you two, otherwise it will take soooooo long till you will have the whole kit LOL! And now I must take another coffee and then get ready to go to my hairdresser. Have a wonderful day! Later today I;ll have to go to my year check up appointment for my epilepsy, so I don;t have all the time of the world. Funny, that just this weekend I had some trouble from it, well, I can tell the specialist about it, but I am used to it. I should have known that it might happen, cause Friday I was much too busy. When possibly I will have some trouble with my absences, one or two days before I get an attak of vigorous cleaning LOL! So Friday i first did the weekend shopping, okay that's normal, but then I also did a good dusting, then a good vacuum cleaning and above that I even washed the curtains and while they were drying I even did the windows. Too much in short time, but it looks good. So Saturday and Sunday too, I had to take it easy, I had some naps in between and already yesterday I was free of it, but still feeling a bit tired. And today it should be all normal again. Hopefully it stays away now for longer time, and I will be happy. As I slept a bit longer today, I don;t have all the time of the world to post, still have to get dressed and so and hopefully I can take the tram to hospital. This weekend they were working on the rails and whatever more(most of it during the night, how wonderful! ), so they had a bus riding instead. But all should ride normally today again. If not, it's een no problem I walk to the hospital, I think it takes about 15 minutes. We'll see what I will do. 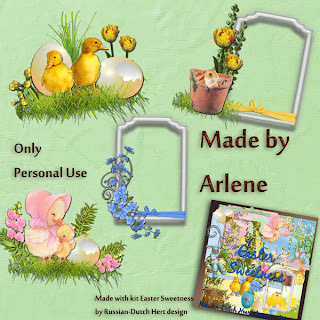 Arlene did sent me some lovely clusters she made with the Easter kit, but as you can understand, I didn;t have much computer time this weekend, so I couldn;t put them together, make a preview and upload them. You;ll have them exr time. 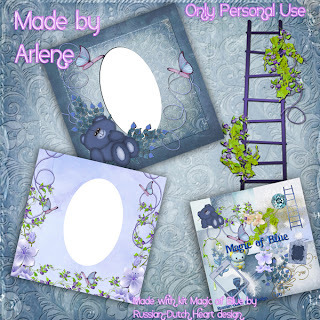 But I have some other ones from Arlene for you. 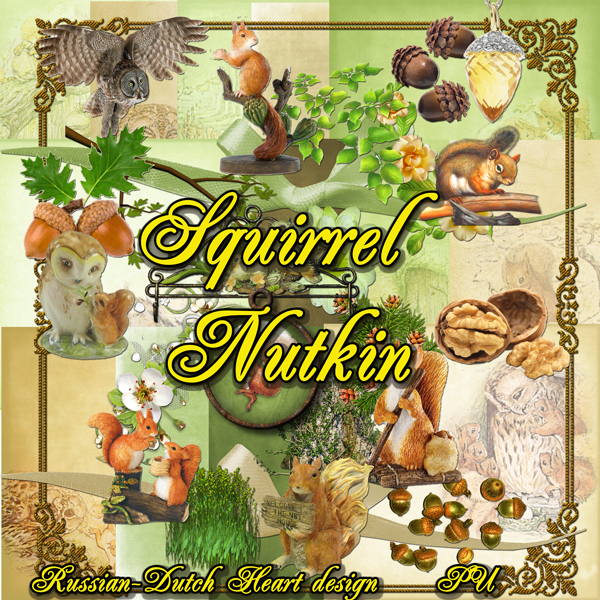 And this new month we will start with a "daily download" serie. I thought it might be nice to make something for "the guys", and came up with a kit named "Men's Emporium". 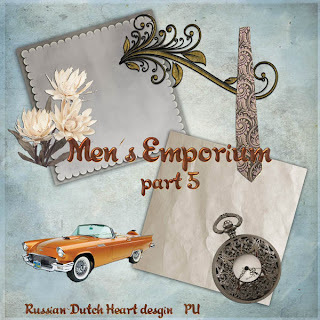 Hope you will be able to use it for scrapping some pics of the men in your life LOL! 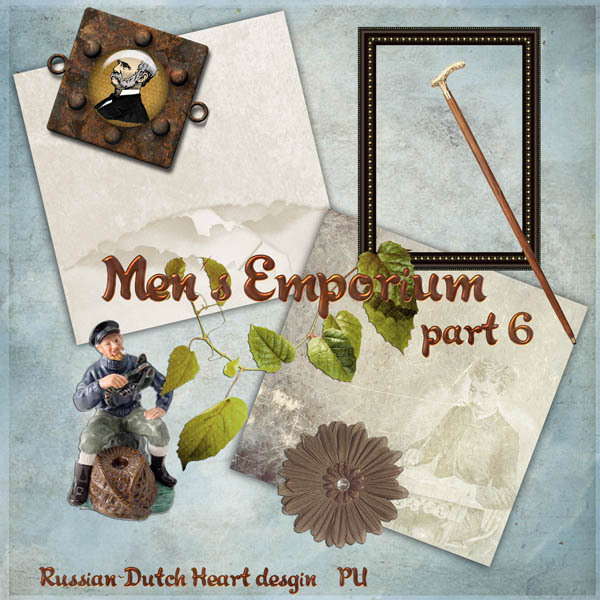 I have 6 prts for you, but I may give you the next days more than one download, however today we start with just part 1 okay? Have to get busy here, so I wish you a fabulous day and till Wednesday! 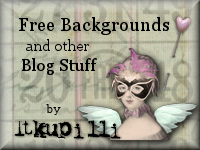 Click the logo to go to the blog with all links. I am Kyra, married to Jan . My mother was Russian, my father Dutch, I discovered digital scrapbooking and now I am hooked to designing freebie kits. I also love gardening, watching English detective series, reading, puzzels, and lots more. PERSONAL license to use the design. 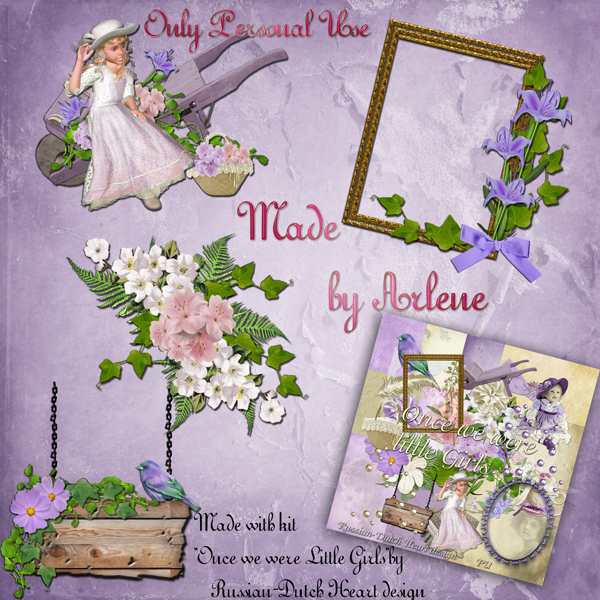 your own personal scrapbooking and crafting projects. to be given away as freebies. *Use these graphics for web templates or web design. images and then claim them as your own. 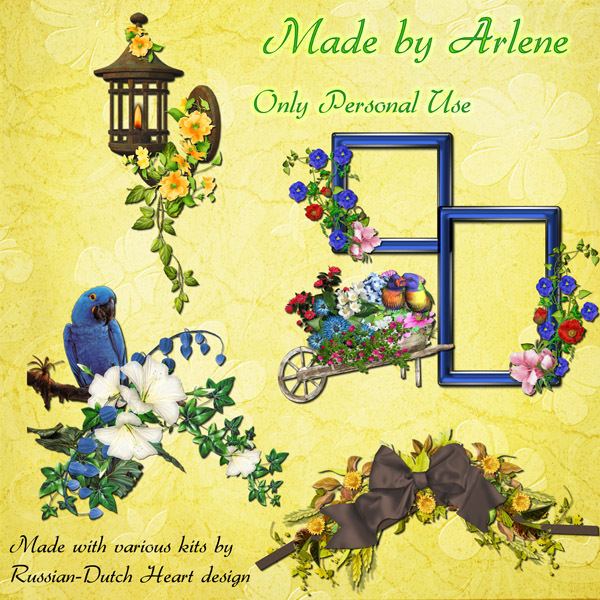 Remember, these images are for PERSONAL USE ONLY !!! You can always mail me. I will answer you.